It was a Friday evening, a great day out with the family and what a wonderful way to relax in front of a roaring fire than to throw on a real classic from your childhood. Martin Short, three comedic legends of the 1980′s, surely this can’t fail to be a hit with a new virginal audience. What started out with 5 viewers, ended up with just 2, and only that one stayed to keep me company and get the benefit of the glowing fire. I will confess, I was completely dismayed at how awful this one was. Did my memory really betray me that much? 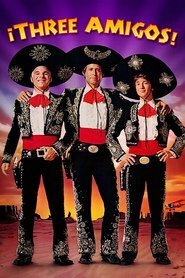 A story line not dissimilar to Galaxy Quest (meets the Magnificent Seven) where 3 out of work actors think they have been hired in Mexico to do a special show for a small village where the village thinks they have hired real heroes to come down sort out their local menace. Hilarity ensues. There are some funny moments in this, no sorry, what I am saying. There are two funny moments and after that, it is just painful to watch this horrible horrible vehicle come to a crashing and embarrassing stop. Taking the horrendous racial cliches away from this for argument, you are left with neither a witty dialogue or even a funny slapstick. I would wager it would have been funnier if they had just improvised as they went along – just keep the camera rolling and see what comedic gold they can mine. But they didn’t. There should be no excuse as Steve Martin was one of the principal writers on this. Had you asked me about this movie before I watched it with my 40+ year old eyes I would have waxed lyrical how funny it was, how side tickling funny the camp fire sing-a-long My buttercup was. Maybe that was my mistake, revisiting a memory that was cemented when I was barely into jeans. The fact my movie literate children got up and left, is a huge indication just how badly this has dated. Couldn’t even find a pre-puberty audience. In short, stay well clear. Don’t go anywhere near this and whatever you do, do not rate this anywhere near the likes of the other real classic Steve Martins.